When water rolls off a roof by the buckets-full and cascades over the top of your gutters, down the exterior walls, to the ground below, you know you have a problem. As water seeps into the ground, down the foundation wall, into your basement, you need to take care of this problem. When you have a leaky basement, it’s time to act — STAT! Who do you call when you have water in your basement? You could call a basement waterproofing company. They’ll be glad to jackhammer your basement floors, install an elaborate drainage system, and waterproof your basement walls in an effort to keep water out. However, if the cause of the water problem isn’t addressed, it may result in you flushing thousands of dollars down the drain when fixing the problem could be much easier and less expensive. Start off by doing a little troubleshooting yourself. Trace the water from the roof to where it lands on the ground to determine where the problem lies. Sorry to all the basement waterproofing companies out there, but the leading reasons why basements leak is because water isn’t draining away from a house properly. What are common causes of a leaky basement? If you were to walk outside with an umbrella while it’s raining, odds are you’d quickly see where your problems are coming from — your gutters! Water moves down the slope of your roof towards the gutters. Water meets in valleys, between two roof surfaces, where it races down the metal or shingle channel (v groove) towards the gutters. If you own a multi-level house, you may have gutters on upper levels that drop water onto lower sections of roof before it drains into first level gutters. In any of these situations, water is moving across the roof surface into a gutter or a series of gutters. The harder it rains, the more water volume your gutters have to handle. There’s a point at which your gutters could become overwhelmed and fail. How many gallons of water pour off your house when it rains? If you live in a Cape Cod or ranch style home, you may have gutters on one level. Your gutters are either located on the front and back of your home or on all four sides. You may have a valley or two where water collects in a channel and drains into the gutter below. If you live in a larger home, you likely have gutters located on 2 or 3 levels. 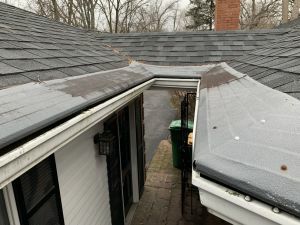 In this case, some of the water likely transfers from the highest gutters into the lowest level gutters by way of draining onto the roof surface. The volume of water flowing off a multi-level house surpasses water volumes on simpler, ranch and Cape Cod style homes. Anecdotal observations indicate that home builders are not good at designing homes for effective water management. They build homes for looks and curb appeal. When’s the last time the first thing you looked at in a home was its gutter system? Kitchens. Yes. Bathrooms. Yes. Bedrooms. Yes. Gutters. Never! It would be nice to believe that architects do a better job at creating and specifying effective guttering and drainage systems. Even if they do, it wouldn’t be surprising if home builders and homeowners cut corners when it’s time to pay for and install new gutters. If a builder can squeeze a few hundred dollars more profit out of a new build or a remodel, he will. If his gutter installer only has a 5” gutter machine instead of a 6” gutter machine, oh well. That’s good enough. The homeowner will never know. This likely happens more often on spec homes than custom-built homes. Whether you want to stop water from seeping through basement walls or floors, let’s discuss why you have a leaky basement and what exactly you can do to repair basement leaks. 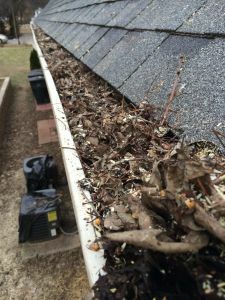 Clogged Gutters — Gutters clog due to leaves, sticks, twigs, shingle granules and foreign objects tossed up there by your kids. Baseballs, lacrosse and tennis balls, frisbees. You name it, if you have kids, one of more of these items has likely been lost inside your gutters. Even if you don’t have any number of balls or frisbees stuck in your gutters, odds are you have leaves and other debris. Leaves and debris will work its way towards the downspout mouth opening and clog it. 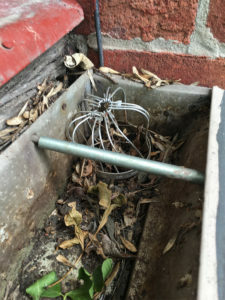 Once the downspout opening is clogged, water will build up inside the gutter until the gutter is unclogged by you or me. A pro tip: if you have installed or have contemplated installing the expanded metal cone filters at the top of your downspouts, don’t. Remove them if you already installed them. Leaves will wrap around the metal cone and render the downspout useless. Water could fill the entire gutter due to this problem, causing your gutters to overflow every time it rains. Leaky Gutters — Gutters leak for a number of reasons. Metal deterioration and rust used to be common with galvanized metal gutters. It is less prevalent today due to most homes having aluminum gutters. Aluminum gutters are less susceptible to deterioration. Most leaks are caused by caulk that has failed at the joints and end caps. Caulk can breakdown due to UV rays that are constantly shining down upon the gutters. When caulk deteriorates, cracks and peels, water will seep though the seams in the metal, causing leaks. In some cases, it’s a constant drip while other cases it can be a solid stream of water. Dripping water will saturate the ground below. If it’s in the grass, flowers or mulch bed, it’ll seep into the ground and can keep your foundation wet for extended periods of time. 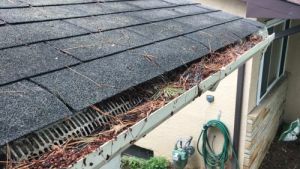 Improperly installed gutters — Believe it or not, this problem is way more common than you would think. Here’s why. Very few gutter installers use levels to verify the pitch of gutters. As a result, they are constantly guessing how to pitch the gutters. There are many ways they do this, but they’re banking on luck each time. Whether by sight or by water test, the sheer lack of willingness to use the proper tool — a level — to do the job correctly often results in gutters that hold water. When gutters hold water, every time it rains, water rises higher and higher. Using U.S. Geological Survey’s water volume calculator, when a typical home has over 1,000 gallons of water flowing off the roof into the gutters, it doesn’t take much extra water for the gutters to overflow. We can’t tell you how often we see gutters that are holding water nearly to the brim. It’s no wonder that every time it rains, water pours over the gutters. Gutters that are too small — Nothing is more disappointing than arriving at a newer home to find that the gutters are too small. It’s less of a bummer on to see them on older homes because 5” gutters were the norm for decades. Visiting newer, large homes with 5” gutters is a shame. Some of these homes don’t have a chance of moving water off the roofs and away from the foundations, especially when much of the rainwater flows onto the roof rather than from gutter to downspout to gutter. We have encountered situations (see photo) where 1/2 of the entire front roof is being channeled into a single 14” gutter. It’s shocking the extent to which home designers and builders fail to make provisions for proper water management. Homeowners are the ultimate victims because the last thing they are looking at is their gutters. It’s not until after they move in that they realize they have a real problem on their hands. Damaged gutters — Damaged gutters are relatively easy to replace. If a gutter has been hit by a tree branch, it can cause water to collect in it or spill over where the damage occurred. Whether tree, wind or hail damage, if the damage to your gutters and/or gutter guards is extensive, it’s worth filing a claim to have them looked at and replaced. Insurance would rather help you fix/replace your gutters than allow water to further damage your exterior, interior and foundation walls. We can help with these claims. Clogged downspouts — Clogged downspouts happens less frequently than clogged gutters. Since it’s pretty much a straight vertical drop, leaves and debris are less likely to lodge inside downspouts. However, this isn’t always the case. If sticks, twigs or larger objects, like a tennis ball, get into your downspouts, water flow will be greatly reduced, if not stopped altogether. Clogs commonly occur in the elbows — the curved parts of the downspout at the top — and sometimes at ground level where the spouts transition to underground PVC drainage. We have seen situations where both these areas are packed with debris, preventing water from moving through the downspouts. If this happens, it’s likely that you will see water spewing from the seams in the spouts as well as collecting inside and spilling over the gutters. Water will puddle around the base of the gutters and downspouts, seeping into the ground below. If left clogged during the cold, winter months, the vertical seams that run down the back of the downspouts will often split, requiring you to replace them. Clogged or broken underground drain pipes — Underground drain pipes can be one of the most effective ways to get water away from your house. If you have trees planted in your yard and the root systems are somewhat shallow, these roots will often find and can easily penetrate through seams in the pipes. Roots, concrete sidewalks and asphalt paths can also collapse pipes, so it’s important to make sure that water can pass through the pipes. In cases where the pipes have collapsed or have become clogged by tree roots and dirt, water will back up into the downspouts and leak through any seams. Since the transition from the downspout to the underground drain takes place at ground level, right next to the foundation wall, if left unchecked, thousands of gallons of water a year can pool around and seep into the ground, causing a leaky basement. Downspouts that terminate too close to the house — This is an easy problem to fix and one that shouldn’t be ignored. An elbow at the bottom of a downspout — looks like a 90 degree turn — only extends about 9” inches further away from the house than the downspout. If you don’t add another section of downspout, a plastic or concrete block onto which water can drain away from your house, or a plastic flex-pipe or PVC drain — above or underground — water will simply spill out onto the ground next to the foundation, causing erosion, water damage and possibly a leaky basement. Literally hundreds of gallons per rainfall or tens of thousands of gallons a year can collect and seep into the ground at the base of each downspout if it’s too close to your house. The best bet is to make sure the downspouts extend at least 4-5 feet away from the foundation wall and the water is moving away from the house on a downward slope. Failure to take these steps will likely result in foundation damage and a leaky basement. Ground slopes towards the house — This is a no-no. The last thing you want is for the ground to be sloping towards your house. This means that every time the ground gets wet, water will flow towards your foundation wall. While it’s easy to build up the area around your house, it may also be a good time to dig a little deeper to make provisions to waterproof the area below ground, around your foundation walls. While this falls outside our area of expertise, an experienced landscaper, landscape architect, or structural engineer can steer you in the right direction. There are lots of places to look online, like YouTube, or simply search for answers on google.com. The bottom line is that if the ground around the perimeter of your home slopes towards the foundation walls, you’re going to have to fix this issue in order to drive water away from your home and avoid a leaky basement. If you have downspouts that terminate close to the house, follow step #8 to take care of the problem. Building a house in an area with a high water table — Again, this is outside the scope of our everyday work, but if you own a house that is prone to flooding or has a high water table, you’re likely already familiar with the problem and remedies. If you’re in the market to buy or build a house, you should be able to view public records to investigate whether the area has been subject to flooding. We walk through yards that are like walking in marshland. The grass is beyond wet. The earth is saturated and soggy. It’s no wonder they have leaky basements, too! Eight out of 10 common reasons why you have a leaky basement are as a direct result of gutters and downspouts failing. If you take care of these issues by keeping your gutters clean, making sure they are sized, installed and pitched correctly, you will likely fix your leaky basement without ever contacting or contracting with a basement waterproofing specialist. Even if you ultimately hire a waterproofing company, they’ll likely tell you that you also need to keep your gutters and downspouts clean. After all, what good is waterproofing your leaky basement when the real cause of the problem hasn’t been addressed and fixed? If you have a leaky basement and any of the issues related to your gutters and drainage systems exist, give us a call for a free, no obligation estimate. We’ll help you assess what is going on at your house, make recommendations, and offer you solutions to help you fix the problem right the first time.